It has used Palmyra’s ancient amphitheatre as a venue for public executions. THE ISLAMIC STATE jihadist group has recaptured Palmyra after Syrian armed forces pulled out from the desert city, the Syrian Observatory for Human Rights said. “Despite the ongoing air raids, IS retook all of Palmyra after the Syrian army withdrew south of the city,” said Observatory head Rami Abdel Rahman. The IS-linked Amaq news agency also reported that IS regained “full control” of the city. Already today, a Russian aerial onslaught killed scores of IS fighters, forcing the jihadists to withdraw from the ancient city just hours after they had re-entered it. The retaking of Palmyra, a UNESCO World Heritage site famed for its Roman-era ruins, was considered a major symbolic victory for Assad’s forces. 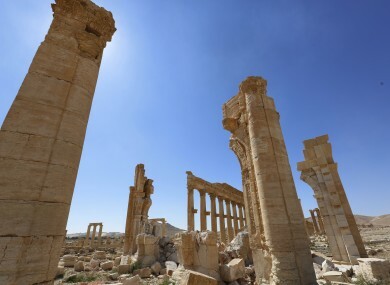 Islamic State overran the Palmyra ruins and adjacent modern city in May 2015, sparking a global outcry and fears for the UNESCO world heritage site known as the “Pearl of the Desert”. The group then blew up two of the site’s treasured classical temples, its triumphal arch and a dozen tower tombs. Email “Islamic State has retaken the ancient city of Palmyra”. Feedback on “Islamic State has retaken the ancient city of Palmyra”.